I didn’t know Sasha’s work when that episode first aired, but during a recent rewatch, I was struck by the absolute rightness of her choice—of Sasha in that Gaga ensemble, which is as high-drama and arresting to look at as it is grounded in something historically and artistically specific. A feat of both glam and thoughtfulness, which is a pretty good summation of Sasha’s drag, period. 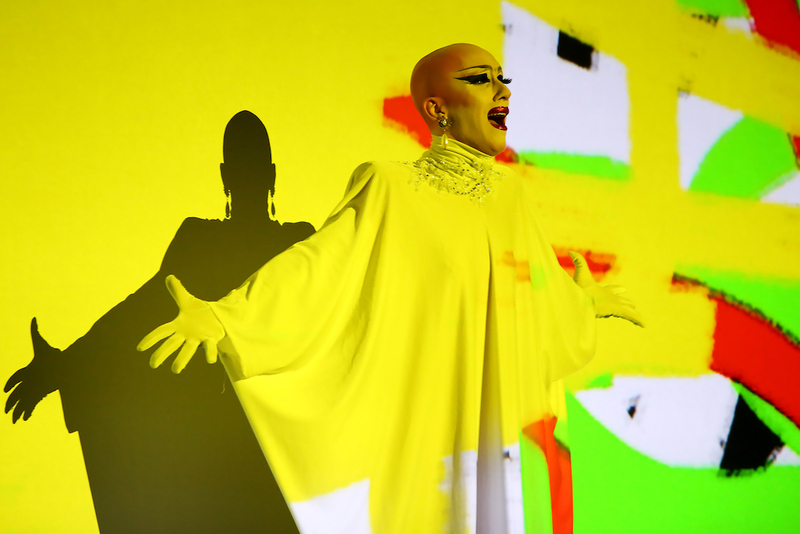 From that first brush across the Drag Race runway—and into the mainstream consciousness—Sasha Velour has been making her aesthetic preferences clear. They’re bold, brainy, usually bald, and unwavering. A lot has happened in the two years since her Drag Race win, when her platform exploded. In many respects, she’s not the queen you’d expect to be speaking at the Teen Vogue Summit or curating runways at New York Fashion Week, both of which she did last year; although she’s extremely articulate in her speech and in her art, she has an avant-garde sensibility and quirky Brooklyn roots, which don’t fit the typical “mainstream” drag mold. But she has nonetheless accumulated a wide audience—as wide an audience as any drag performer is currently likely to have. And on Thursday, she took another major career step: she opened her first solo theatrical venture, “Smoke & Mirrors,” at New York Live Arts, where it will run again this weekend before eventually going on tour. “Smoke & Mirrors” is a 90-minute, multi-arts, one-queen extravaganza. 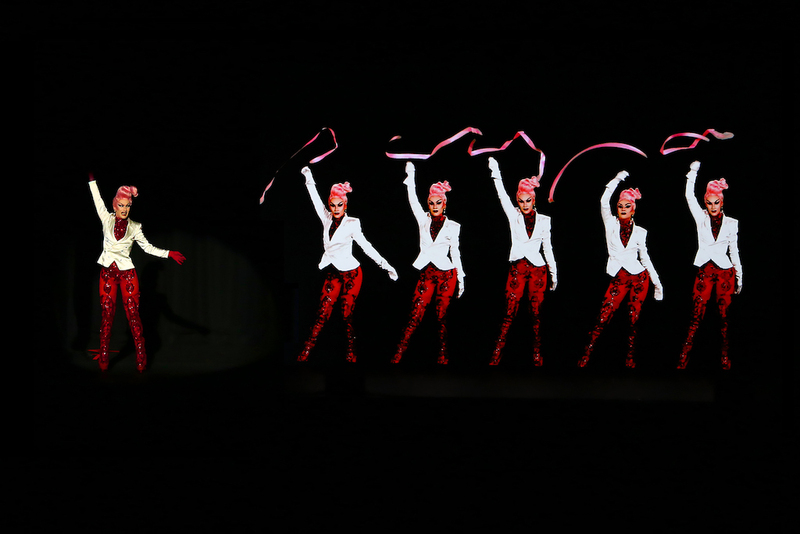 It uses projection designs Sasha rendered herself, which move like brushstrokes on scrim. There’s some old-school stage magic, a dozen conceptual lip-syncs, and a fleet of sculptural costumes, including one piece—a metallic set of wings—that presses something like 30 pounds of weight into her shoulders. It’s undoubtedly her most titanic production effort to date. The thing about Sasha, though, is that she doesn’t sprawl out just for the feel of the sprawl. “Smoke & Mirrors” is a big, glittery spectacle, befitting a queen of her stature, but it’s also, in many ways, art in hyperfocus. It’s deeply autobiographical. It’s pensive. It takes a microscope to the themes Sasha is most interested in: fame, gender, duality and opposition, perception, illusion. I include illusion not because she saws herself in half while lip-synching to Lana Del Rey’s “High By the Beach,” although she definitely does that; I include it because “Smoke & Mirrors” asks us to consider the masks we wear, the shadows of artifice we all throw, as we navigate the world. Illusions, masks, shadows, drag— call them what you will, “Smoke & Mirrors” is working to “pull back the curtain” (to use Sasha’s phrase) on the beautiful and complicated ways we costume ourselves. The show is also pulling back the curtain on Sasha herself, who—despite the semi-incongruous distance such a large theater space forces between a drag performer and her audience—feels more reachable than ever. The show is very Sasha: it’s got that intellectualism, that feeling of artistic and historical groundedness, plus (thank goddess) dramatic glam in a vivid, deliciously cohesive color palette. It’s a firm articulation of its performer’s personal history and her individual aesthetic, at a moment public attention might have diluted our sense of both. I spoke with Sasha about some of the inspirations behind “Smoke & Mirrors,” about the many versions of herself that coexist, and about how drag is, definitely, magic. Our conversation is condensed below. What does the title of your new show, “Smoke & Mirrors,” mean to you? I love that at first glance, it describes deceitful illusion. The clichéd phrase refers to very early magic tricks and vaudeville. They started introducing phantasmagoria machines—literal smoke, literal mirrors—to give the impression of something that is not real. 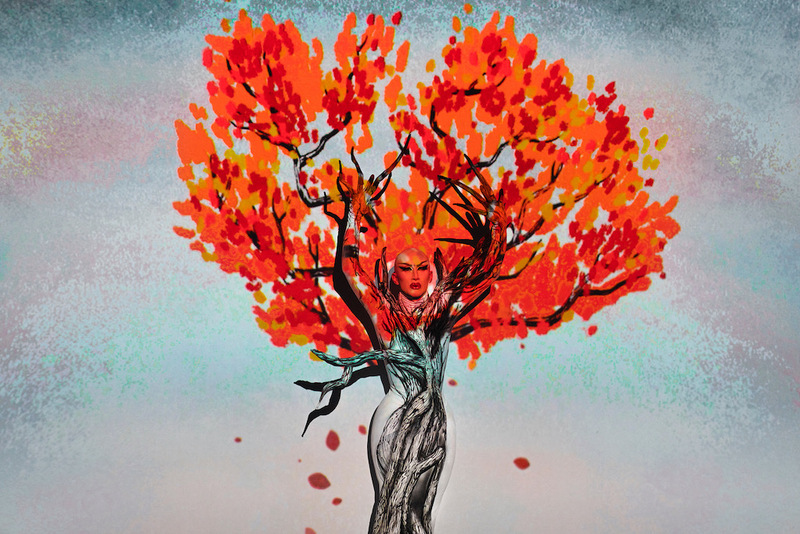 I fell in love with magic as a little kid, for the same reasons that I was fascinated by drag—I was interested in anything that took me out of quotidian reality, [and brought me] into a realm of fantasy. Drag obviously does play with reality and the audience’s perception of what is real, but I also think that drag pulls back the curtain at the same time, so it’s not like a classic magic show. We’re always showing people the workings of our magic, so that they can see it’s possible for them to mastermind reality as well. There’s a huge sense of personal history in this show—you’ve even included home video footage of you as a little kid. I also know you’re a performer with a deep connection to queer history and drag history. What’s the importance, for you, of looking backward? Looking back at your personal history can be a good metaphor for looking at the history of a community or an art form. Sometimes we get a little too focused on the newness of things, we forget that there are long-standing traditions. Not only do we not want to be reinventing the wheel, but I get really inspired by the drag that came before me. I get really inspired by what I did as a little kid, when I thought I was being clever or trying to be escapist. That’s probably the product of growing up in a family of historians. It’s also a big part of Jewish tradition, which is my family legacy. In order to tell a story properly, you have to ground it in history. But how do you do that while keeping it entertaining, light, fabulous, stimulating drag? That’s a challenging area to navigate. I was really struck by the doubles and multiples of you in this show—through projection, there’s sometimes many of you on stage at once, or there’s this sense that seemingly contradictory versions of you are coexisting. I’m curious to hear you talk about the theme of multiples. As you can imagine, having a version of yourself existing on TV is a bit of an identity challenge. When Drag Race was airing and people were getting to know me through a version of myself that I had no say over, it got me thinking about this idea of very clear multiples of yourself. That literal experience of it [helped me] to realize all the ways this had already been a part of my life, and is a part of everyone’s lives. People interpret us differently than we intend sometimes, things get taken out of context sometimes…maybe we are more layered or inconsistent than we, ourselves, realize. I like being able to bring that into visible form. Maybe people can look at it a little more clearly. What’s your experience of living as many Sashas now? Do you feel there is a “real” you? I’m trying to let go of the idea that there is an essential, “real” me. You get too protective about that idea, and I’m not sure I know, clearly, myself. I think the best solution is trying to be at peace with the shifting back and forth, at peace with the multiplicity. To encourage people to see me that way, and to see each other that way. I would love to discuss the final number, in which you embody a tree going through the seasonal cycles. Can you talk about building that, and why you wanted it to be the final image for audiences? I’ve had the idea of a tree that bloomed and then lost all of its leaves for winter for a while. In some ways, when I started looking at all the different things I wanted to say in this show, that felt like the most important—explosions of emotion and color and passion don’t have to be a permanent state, they can be a flash, they can be fleeting, they can end in heartbreak, and still have value and beauty. I like it as an ending because it’s unfixed, undetermined. You get the feeling that this tree is gonna keep blooming and dying throughout the seasons, which is the only conclusion I could really give, for this show. Also: the song and the tree that I based it on are really personal. There’s a man-made hill outside the home where I grew up in central Illinois, with like, a fully dead tree on it. I always imagined it coming back to life and joining the seasons yet again. I listened to a lot of Nina Simone in the weeks following my mom’s death, when I was living there with my dad. The sound of [Simone’s] voice and her piano, together with the image of this tree, feels very personal and autobiographical. What are you hoping audiences come away with, in terms of their understanding of you? Or their renewed understanding of you, if they thought they knew you before? Hopefully they see me as being more multiple than they realized. I do think I am the site of lots of contradictions at times, and I like that. There are definitely skills in this show that I don’t think audiences of Drag Race would necessarily know that I have, like the ability to write and produce a show. That’s a very specific theater skill that is not tested on television, and that’s probably the thing I’m most proud of. And then there’s a lot of humor and heart, there’s dancing…all of those are part of the picture of me that I don’t know if people really understood before. You hail from the Brooklyn drag scene, of course, which is known for being a little scrappier, experimental, kind of beautifully messy… What has the transition been like, from making art in that environment to making art on this scale? Has it been hard to remain connected to Brooklyn? It was an interesting transition. Drag doesn’t always exist as part of mainstream entertainment, and that has been very freeing for it—it’s not held to the same standards of money, and really, I think this is a financial discussion, often. Brooklyn drag doesn’t require that its performers look wealthy, but mainstream drag increasingly does. Keeping up with that is very…questionable. [Laughs] At times it can be enormously fun, and at times it seems really unappealing. I actually feel a lot closer to some of the performers in my community than I did before. The Brooklyn drag scene that I was part of has been so supportive of me this entire time. Although I want to advance opportunities for myself—as important as “Smoke & Mirrors” is to me artistically—I’m equally passionate about creating opportunities for other people in my community. Drag, and specifically the drag that I love, requires lots of people in the spotlight. I want to bring up something you wrote in the program: “From my perspective, a drag performance can be absolutely anything—a speech, a dance, a song, a lip-sync. The thing that makes it drag is really the context and the intention behind it.” I’m in love with that. Can you talk more about expanding the definition of drag, or reconceiving what drag can consist of? Thank you! Right. As it gets more popular, people are trying to figure out what it is, exactly, and what it is not. When I look at the history, it actually hasn’t always been one thing. There were tours in huge theaters, female impersonation, male impersonation, live singing, lip-synching, etcetera. So it seems like it really is the queer intention behind it, and that the audience receives it as being a queer art form, that defines drag. And the political undertones—the meaning, the personal importance of addressing gender, is what defines drag. If it’s about intention and context instead of, like, the physical, then it’s less for an audience member to define, and more for a performer to define. That’s really how it should be. Since your definition is more about intention and context and less about the physical, does it also speak to the kinds of bodies we can see in drag? That’s a conversation that’s been happening relating to Drag Race, and in the wider world. Totally. I’ve always worked in scenes that had AFAB [assigned female at birth] performers as drag queens, that had lots of trans people performing in drag, so it doesn’t even seem like a question. But I have to remind myself that this is still part of a debate. I think Drag Race has informed a lot of people as to what drag is, but it’s left some things out. Definitely. It’s sparking conversations, which is something. Exactly. But it should just be the introduction. Last thing about intention: what, if you had to distill it or summarize it, is the intention behind your drag? Well, my intention is always to put on a show—it’s very important to me that the intention behind drag is always entertainment. But the best show that I can put on is one where I bring truthful bits about myself into the mix. And part of bringing in true pieces of myself is showing the wild places that my imagination can go—in terms of fashion, in terms of gender, in terms of expression—and reminding the audience that they can have more fun with their own appearance, and their own articulations or sense of self, just the same way that a drag performer might. What could be more entertaining than being reminded that the world is more magical and full of possibilities than you gave it credit for?